Thuwal/Saudi Arabia — The new sensors developed by Kaust scientists use fluorinated metal-organic frameworks (MOFs) as the sensing layer. MOFs are porous materials comprising a regular array of metal atoms held together by small organic-molecule linkers to form a repeating cage-like structure. 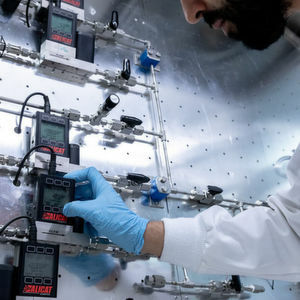 The University's Mohamed Eddaoudi, who led the two studies of the sensor's efficacy, explains that by altering the metal and organic components, MOFs can be tuned for applications ranging from gas separation and storage to catalysis and sensing. Many people have attempted to develop simple, efficient, low-cost SO2, CO2 and H2O sensors without success. The approach taken by Eddaoudi's group was to develop a fluorinated MOF, which Belmabkhout and Tchalala tested as sensor materials for these gases. Testing of these state-of-the-art materials was in collaboration with Khaled Nabil Salama and his team. Traces of SO2 are invariably present in the flue gas produced by factories and powerplants, and SO2 can poison materials developed to trap CO2 for carbon capture and storage. The first study shows how the sensor can measure the concentration of carbon dioxide and the level of humidity in the air. While the second study of the same fluorinated MOFs shows it can detect the harmful and corrosive gas sulfur dioxide, or even selectively remove it from powerplant flue gas. Both sensor platforms, the team showed, could monitor moisture and CO2 levels under real atmospheric conditions. The signal is calibrated against CO2 concentration, humidity level and mixtures of both. A QCM-based sensor could also detect SO2 in the air at levels of just 25 parts per million. 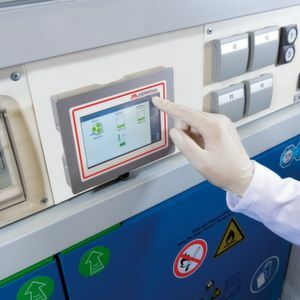 The technology developed at the Advanced Membranes and Porus Materials Center is capable of detecting various gases with a high degree of selectivity and sensitivity. It was recently granted a US Patent .